Floating Jetties have successfully replaced the conventional concrete and wooden docks. Made using high density polyethylene, our Floating Jetties are especially engineered for optimal load bearing capabilities. The major applications of our Floating Jetties are jetties, floating walkways, catwalks, water sports launch pads, aquaculture, jet-ski docking, motor boat docking, etc. Floating Jetties are made by assembling the PU filled cubes in a set of four and then the cubes are inserted. These cubes are light in weight, portable, tough and buoyant. These Floating Jetties can easily withstand any weather conditions. 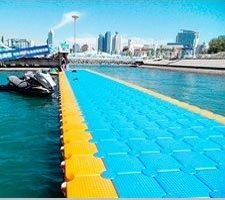 We provide Floating Jetties in different colors, which are used for the purpose of creating advertisements, walkways, jetties, platforms, etc.